We are happy to announce that the City of Los Angeles is working on establishing its first Bicycle Friendly Business District in Northeast Los Angeles. For the past year, the Bike Program has been developing a Bicycle Friendly Business District (BFBD) program to foster a broad and engaging range of bicycle friendly features in business districts or corridors. The program aims to provide districts with adequate bicycle facilities including bicycle parking and repair stations, bikeways, creating maps of the bikeway network, installing signage, and facilitating bicycle wayfinding. By cultivating bicycle friendly business practices in local businesses and developing local business districts to welcome patrons on bicycles, these districts seek to build community, increase physical activity, and make streets less congested while supporting Los Angeles neighborhood businesses. Bicycle Friendly Business Districts – What are they? A BFBD is a partnership between the City, neighborhood and business organizations, and local businesses that improves a business district’s Bicycle Friendliness through bicycle infrastructure and local business promotions to people travelling by bicycle. 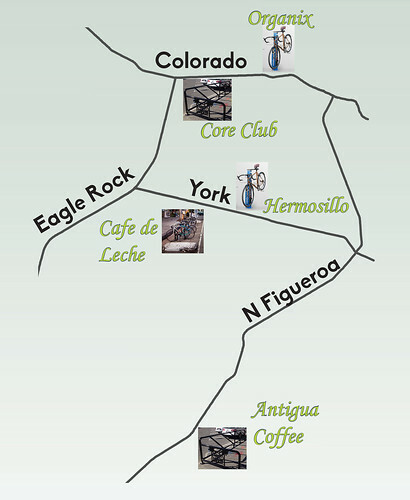 The district encourages and promotes short, local trips, especially for shopping, dining and recreation. The BFBD program complements complete streets and traffic calming objectives in order to capture local dollars and further neighborhood development in Los Angeles. Districts cooperate with the LADOT, the Council Office, and local community partners to implement services already offered free of charge through the LADOT Bike Program. These services, infrastructure, and other program elements combine with local investment in bicycle amenities and programs privately funded by neighborhood and business partners. The BFBD program is in its first pilot phase in Northeast Los Angeles. This pilot will serve as a basis for a citywide program expected to be launched in 2015-16. Northeast LA also has abundant commercially zoned corridors and already has significant bicycle infrastructure commitments. Local Businesses have already generously pledged maintenance responsibilities for Bicycle Corrals and Bicycle Repair Stations in the project area, starting the trend of bicycle friendly business practices. For the pilot, the LADOT Bike Program has partnered with Occidental College Urban and Environmental Policy Institute and C.I.C.L.E. to bring together community partners into a consortium that will envision and pursue amenities and events that will make Northeast LA neighborhoods more friendly to bikes through both infrastructure, business, and cultural offerings. 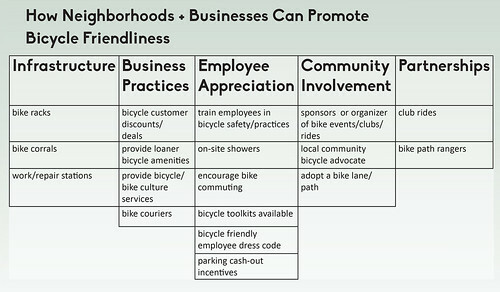 What can businesses do to be Bicycle Friendly? A Bicycle Friendly Business (BFB) extends a warm welcome to customers arriving by bicycle and benefits from the resulting exposure and goodwill within the community. A BFB might offer discounts to people travelling by bicycle, bicycle-themed promotions, bicycle-friendly amenities, benefits to employees who bicycle, or other incentives. I am psyched you guys are getting some use out of my photo! Use as many as you like. Huizar’s office has been really great with such forward thinking planning efforts. Hopefully Cedillo’s office will come around and make this happen. The reality of shopping in NELA was revealed in Cullen McCormick’s study of the York Blvd. road diet – where he revealed that a little less than 25% of shoppers were driving to local shops and that 75%+ were walking (with a few bike riding and taking the bus). 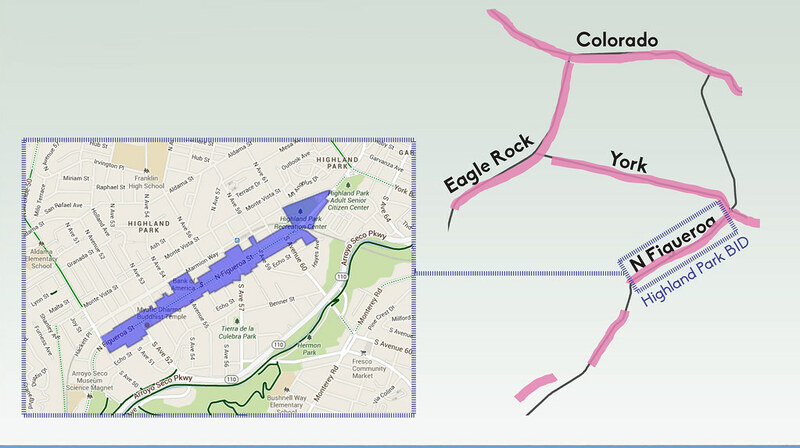 Connecting Oxy, South Pasadena, Chinatown, and Frogtown to this district is the next big step after the BFBD and the Figueroa bike lanes. Thanks for your hard work and I hope that LA can hire some of the interns who’ve been slaving away for $0/hour in your office. We can’t afford to lose the talent! Also, we really, really love our interns! Shout outs to Karina Macias and Eli Glazier who have been of great help to me in putting together this program! Why don’t the CYCLISTS PAY for all of these “improvements”?! They are the only ones to benefit from it…make THEM license, register, and most importantly INSURE their VEHICLES, since they enjoy breaking the laws of the road, driving recklessly, and not only endangering themselves, but also the drivers who have to swerve to avoid them when they CUT CARS OFF! http://taxfoundation.org/blog/statelocal-road-spending-covered-user-fees-user-taxes-categories-separated-out Sorry buddy, looks like you need to pay up. California only pays 34% of road infrastructure with user fees and taxes. Funding for these improvements are coming from Measure R which passed by 2/3 majority. The BFBD program represents a public/private partnership, where willing business owners and community members can come together to fund or seek funding for bicycle-oriented programs and amenities. The bicycle infrastructure that has already been installed by LADOT has been funded by local transportation funds that are exclusively restricted for use in bicycle and pedestrian improvements. The Bicycle Repair Stations are funded by a grant from Bikes Belong (now PeopleForBikes), and additionally, the City applies for and receives a healthy portion of state and federal grants. Or you know, you can just slow down, and be more careful and attentive behind the wheel. Seriously: cars are more dangerous and deadly to cyclists (and each other) than cyclists are to anyone else including themselves. Why are bike lanes not included on North Figueroa? And why isn’t there any bike infrastructure on North Fig or why isn’t any being added as part of this plan? The North Figueroa bike lanes are in the 2010 Bicycle Plan and they are currently in design and going through the public process. 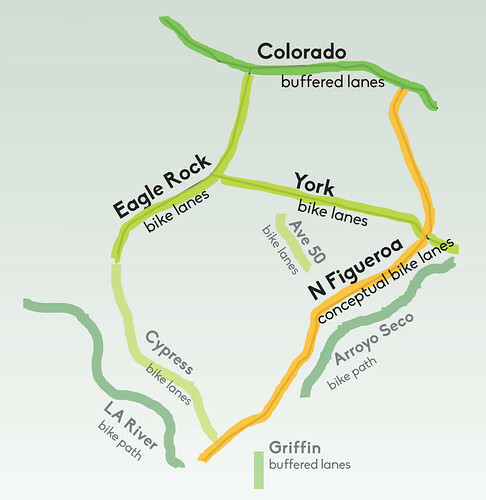 There will be additional public outreach about the North Figueroa bike lanes hosted by Council District 1- we will definitely keep everyone posted about these meetings here on the LADOT Bike Blog. This is great news for everyone who lives in, shops or travels through NELA! How is Venice not the first bicycle-friendly business district in LA? on March 6, 2014 at 1:16 am | Reply A Los Angeles il primo quartiere commerciale "bike friendly"
How can other L.A. business districts get a bike district? What is the process? 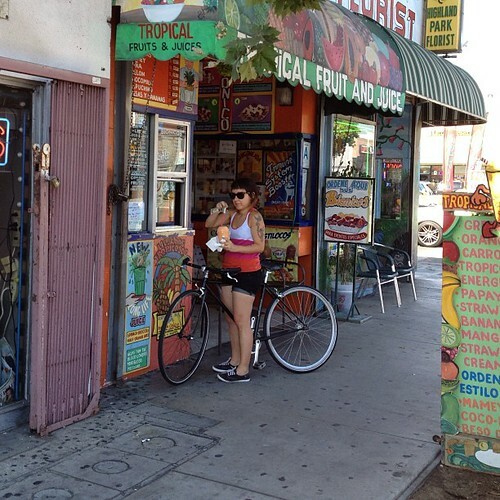 Would love to see “My Figueroa” become a Bicycle Friendly Business District. Please provide some suggestions about how to promote the value of customers who arrive by bike, especially around University Park, USC and Expo Park where there a hundreds of bikes an hour on Figueroa and other streets. We are hoping to hold a ride in Spring 2016–would love your support to USC Bicycle Coalition and BikeSafe USC with the project.